I frequently meet new mums, and when they find out what I do, the next line is hear is ‘I wish I had done a newborn shoot with ……..’ Of course I usually ask them why they didn’t and the same replies come up over and over again, so I thought I would take some time to answer those concerns in the hope that it may put your mind at rest if you are considering booking! Sometimes they don’t! And that’s just the truth of it. There are of course those dream babies that come into the studio, sleep for 2 hours straight whilst mum sits and drinks tea and catches up on Facebook, but in reality, they are few and far between. Most babies will need a little bit of help! This is one of the reasons I ask mums to hold off doing a big feed until you get to the studio. This means baby will be nice and full. A sleepy baby is always a full baby! And yes I know this can take an hour, but that’s ok. I’m happy to sit and chat for an hour whilst you are feeding, and take the time to make sure baby is settled. If he or she is still fussing, then I will wrap them, this works 99% of the time – and even if they are still awake, we can get some beautiful pictures with eyes open. 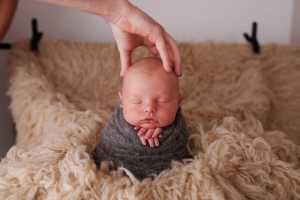 Finally, if it’s just not happening, and baby is crying, stressy, and really not wanting to play ball, it’s usually because they are uncomfortable (wind, tummy ache, reflux), then I will just re-book you at no extra charge for a few days later. Rest assured, NEVER once have I not got beautiful shots of a newborn sleeping! What if my toddler won’t play the game? I have a toddler – yep – I know they are pretty much the hardest little pickles to control and make behave – even with packets of sweets dangled in front of them for bribery! If they are coming in with a newborn brother or sister, I usually ask for them to arrive for the first half an hour or last half an hour, so they don’t get bored, hot and grumpy whilst sat in the hot studio. But, if the session is for them, I would recommend an outdoor session, toddlers are happiest when they are free, running, playing, jumping, with no boundaries. Plus we get more fun and more natural smiles! So much nicer than the gritted teeth fake smiles! Most kids do not co-operate! But I never let that stop me, and eventually, we always get the cutest shots. What if my baby is sick, poos, wees everywhere? This is the one thing that worries nearly every new mum or dad that comes into the studio, and I’m here to tell you, us photographers do not care! We are so very used to it, and rarely a session goes by where I don’t have some sort of baby liquid on me by the end of it. It’s what babies do. Everything gets washed after each session (including me)! Will my baby get cold? 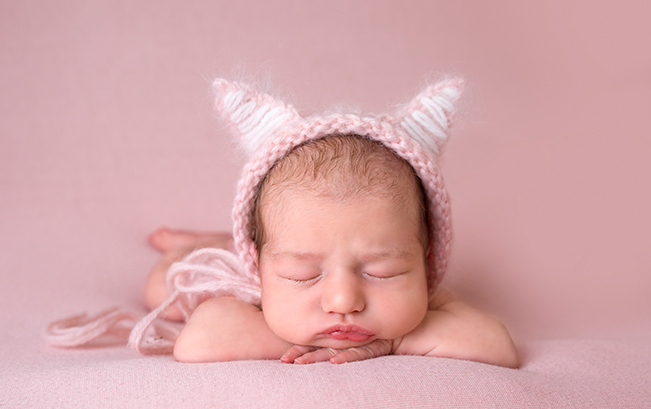 No, I keep the studio very warm for a newborn session, so baby never gets cold – however, you may feel a little toasty, so wear layers that you can peel off if you get too hot! I’ll get pressured into buying more. No. I hate that as much as the next guy! Before you book, I will send over my price guide to make sure you have seen this before committing. If you decide to just buy one image, then that’s no problem. You’ll never get pressured into spending what you can’t afford, but if you really do want all of the images and that giant canvas to go on your wall, then I offer easy payment plans that can coincide with your payday! Is my baby going to be safe? Yes of course. I know how precious your babies are, and I never forget that. I’m a mummy too, and would only ever want my daughter looked after by someone I know would take care of her. I will cuddle, wipe the sick, wipe the poo, and make sure they are safely handled. I have completed newborn safety training and all of the poses I do are completely safe for baby. Some of the poses I’ll have you help out a little too, and do all of the magic in photoshop afterwards. I breastfeed – is that ok? Absolutely. If you’d rather do it in private, just let me know and I’ll step out of the studio. The studio is very private and you will get all the time you need to sit, relax and take your time! I forgot to book a newborn session whilst I was pregnant. Don’t worry, if you’ve just had a baby and you would still like a newborn session, then give me a call. I’ll try my hardest to make sure we fit you in! It isn’t always possible, but if I can, I will! Yep, so do I! You may well have seen the mummy-and-me session I did recently with the very talented Katy from Amor Amor Photography. Hardly any of the shots are me looking at the camera, why… because I don’t like pictures of myself too much. However, I’ve got 3 canvases of the shoot on my wall! I hope that covers off some of the questions or concerns you might have, although if you have something you’d like answered, let me know and I’ll pop it on the list! Visit my to take a peep at the adorable newborns I’ve had the pleasure of photographing. If you would like to book a session drop me a quick message at emma@studiobambino.co.uk.